A star-forming region of the Milky Way looks oddly like a "cosmic lobster" in this photo. 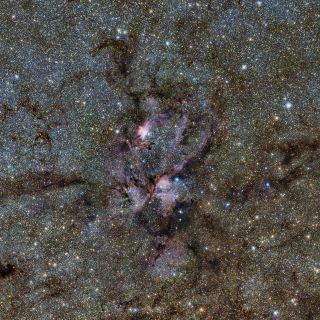 A new photo by a telescope in Chile has captured an amazing view of wispy interstellar clouds creating what appears to be a "cosmic lobster" in a distant star nursery, scientists say. The space cloud formation is also known as the "Lobster nebula" because of its appearance in visible-light images, ESO officials explained in a statement. ESO astronauts also unveiled a new video of the Lobster nebula to accompany the new image. "One of the bright young stars in NGC 6357, known as Pismis 24-1, was thought to be the most massive star known — until it was found to actually be made up of at least three huge bright stars, each with a mass of under 100 times that of our sun," ESO officials said in the image description. "Even so, these stars are still heavyweights — some of the most massive in our Milky Way. Pismis 24-1 is the brightest object in the Pismis 24 star cluster, a bunch of stars that are all thought to have formed at the same time within NGC 6357." This picture was taken using the infrared spectrum of light. While other photos of NGC 6357 have been taken in the visible spectrum, this time scientists used infrared imaging to cut through dust and debris in the foreground and get a more clear understanding of the shrouded nebula. ESO's Visible and Infrared Survey Telescope for Astronomy at the Paranal Observatory in Chile took the photo as part of a huge sky survey named the VISTA Variables in the Vía Láctea that will image the "central parts of the galaxy." "VISTA is the largest and most powerful survey telescope ever built, and is dedicated to surveying the sky in infrared light," ESO officials said in a statement. "The VVV survey is scanning the central bulge and some of the plane of our galaxy to create a huge dataset that will help astronomers to discover more about the origin, early life, and structure of the Milky Way."